The old City Hall and Fire House building was erected at 302 Division Street in 1876, the year of the attempted bank raid by the James-Younger gang. The building’s construction was part of an effort to transform the look of Division Street from frontier settlement to a more respectable, civilized town. The upper floor contained the social rooms for the firefighters, the police headquarters, and the city offices and council chambers; the main floor housed the horse-drawn fire engine rigs; and the basement contained stables for the horses. 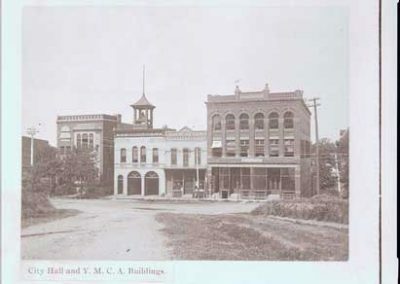 In 1910, a jail was built behind the main building, and in 1917, the city offices moved to the YMCA building next door, now home of the Northfield Arts Guild. The fire house originally had a distinctive bell tower. For many years, the bell was rung for fire alarms and city curfews; it was sounded by pulling on a rope that extended from the main floor to the tower. The bell was displaced by an electric siren in 1924, and the bell tower was removed in 1940. The fire department later moved to the Safety Center at Fifth Street and Highway 3, which was built in 1970. The building has supported other business uses over the years, including a restaurant and candy factory, a violin maker, an antique store, and a clothing store. In 1999, business owners Norman Butler and Diane Burry purchased the building and transformed the basement into the Contented Cow Pub. They also knocked down the old jail building to expand the pub and add an outdoor patio and deck area that is a popular venue for live music in the summer. 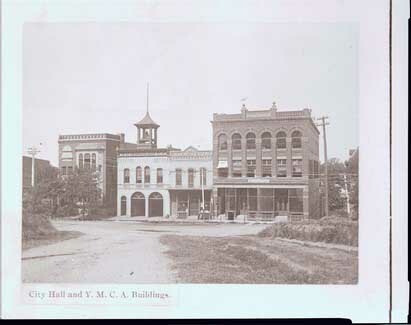 Looking west at the YMCA, far left; Fire Hall, center; and Nutting Block Building.